Helper class to perform TLV encoding Interface of this class (mostly) matches interface of Estimator class. Definition at line 35 of file encoder.hpp. Definition at line 129 of file encoder.hpp. Definition at line 130 of file encoder.hpp. Definition at line 131 of file encoder.hpp. Create instance of the encoder with the specified reserved sizes. Definition at line 31 of file encoder.cpp. Create EncodingBlock from existing block. This is a dangerous constructor and should be used with caution. It will modify contents of the buffer that is used by block and may impact data in other blocks. The primary purpose for this method is to be used to extend Block after sign operation. Definition at line 37 of file encoder.cpp. Definition at line 98 of file encoder.cpp. Referenced by prependNonNegativeInteger(), and prependVarNumber(). Definition at line 108 of file encoder.cpp. Referenced by appendNonNegativeInteger(), and appendVarNumber(). Prepend a byte array array of length length. Definition at line 118 of file encoder.cpp. Referenced by prependBlock(), prependByteArrayBlock(), prependNonNegativeInteger(), and prependVarNumber(). Append a byte array array of length length. Definition at line 128 of file encoder.cpp. Referenced by appendBlock(), appendByteArrayBlock(), appendNonNegativeInteger(), appendVarNumber(), ndn::util::DummyClientFace::Transport::send(), and nfd::face::InternalClientTransport::send(). Definition at line 312 of file encoder.hpp. Referenced by ndn::encoding::detail::BinaryBlockFast< Iterator >::makeBlock(). Definition at line 327 of file encoder.hpp. Referenced by ndn::encoding::detail::BinaryBlockSlow< Iterator >::makeBlock(). Prepend VarNumber varNumber of NDN TLV encoding. Definition at line 138 of file encoder.cpp. Referenced by ndn::encoding::detail::BinaryBlockFast< Iterator >::makeBlock(), ndn::encoding::detail::BinaryBlockSlow< Iterator >::makeBlock(), and prependByteArrayBlock(). Definition at line 165 of file encoder.cpp. Prepend non-negative integer integer of NDN TLV encoding. Definition at line 192 of file encoder.cpp. 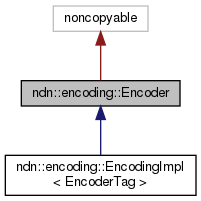 Append non-negative integer integer of NDN TLV encoding. Definition at line 212 of file encoder.cpp. Prepend TLV block of type type and value from buffer array of size arraySize. Definition at line 232 of file encoder.cpp. Referenced by ndn::encoding::makeBinaryBlock(), and prependBlock(). Append TLV block of type type and value from buffer array of size arraySize. Definition at line 242 of file encoder.cpp. Definition at line 252 of file encoder.cpp. References block(), ndn::Block::hasWire(), prependByteArray(), prependByteArrayBlock(), ndn::Block::size(), ndn::Block::type(), ndn::Block::value(), ndn::Block::value_size(), and ndn::Block::wire(). Definition at line 263 of file encoder.cpp. References appendByteArray(), appendByteArrayBlock(), block(), ndn::Block::hasWire(), ndn::Block::size(), ndn::Block::type(), ndn::Block::value(), ndn::Block::value_size(), and ndn::Block::wire(). Reserve size bytes for the underlying buffer. Definition at line 65 of file encoder.cpp. Referenced by reserveBack(), and reserveFront(). Reserve at least size bytes at the back of the underlying buffer. Definition at line 45 of file encoder.cpp. Referenced by appendByte(), appendByteArray(), and appendRange(). Reserve at least isze bytes at the beginning of the underlying buffer. Definition at line 52 of file encoder.cpp. Referenced by prependByte(), prependByteArray(), and prependRange(). Get size of the underlying buffer. Definition at line 269 of file encoder.hpp. Definition at line 263 of file encoder.hpp. Get an iterator pointing to the first byte of the encoded buffer. Definition at line 275 of file encoder.hpp. Get an iterator pointing to the past-the-end byte of the encoded buffer. Definition at line 281 of file encoder.hpp. Definition at line 287 of file encoder.hpp. Definition at line 293 of file encoder.hpp. Get a pointer to the first byte of the encoded buffer. Definition at line 299 of file encoder.hpp. Definition at line 305 of file encoder.hpp. Get the size of the encoded buffer. Definition at line 257 of file encoder.hpp. Referenced by reserve(), reserveBack(), and reserveFront(). Create Block from the underlying buffer. Definition at line 59 of file encoder.cpp. Referenced by appendBlock(), ndn::encoding::makeBinaryBlock(), ndn::encoding::detail::BinaryBlockFast< Iterator >::makeBlock(), ndn::encoding::detail::BinaryBlockSlow< Iterator >::makeBlock(), ndn::encoding::makeDoubleBlock(), ndn::encoding::makeEmptyBlock(), ndn::encoding::makeNestedBlock(), ndn::encoding::makeNonNegativeIntegerBlock(), and prependBlock().